A recently renovated alpine apartment in a traditional Savoyard farmhouse. The apartment is in a peaceful and picturesque hamlet very close to the centre of Morillon village (10 minutes walk). Morillon is part of the Grand Massif skiing area. The apartment is 500m (5-10 minute walk) from the Morillon cable car, which operates in summer and winter for skiing, hiking and mountain biking. There is a ski bus stop outside the door. The apartment has a good sized living/dining area, 2 bedrooms and sleeps 4-6 people. There is free wi-fi internet access. Morillon village has a good range of shops, cafes/bars and restaurants. The nearby lake, beach and recreation area (10 minutes walk) are perfect for families with kids in the summer. The mountain views from the apartment are stunning and hiking and biking trails are accessible from the door. It is possible to ski to the door if you don't mind an off-piste finish! I live in Morillon with my partner, Jamie, and our two children, Juliet and Cameron. Jamie and I have been living in this part of the French Alps for 10 years. We live and work here all year round. In the summer we run a mountain biking holiday business, Ride the Alps. In the winter Jamie is a snowshoe guide and igloo builder. Morillon is a village in the Haute Giffre valley, also part of the Grand Massif. This is one of the most beautiful areas in the French Alps. It has managed to maintain a traditional alpine village feel whilst also being a very successful summer and winter mountain resort. We love mountain sports - mountain biking, skiing, trail running, climbing etc. - and this is the ideal place to do all of these things. It's also a wonderful place for family life. There are heaps of activities on offer for kids all year round. The apartment is just 500m from the Morillon cable car (a 5-10 minute walk) so you can get up the mountain very easily in summer or winter with skis, mountain bikes or on foot. There is also a ski bus stop just outside the door which links you to the other villages in the valley. The village centre is also a 5 minute walk away with it's range of shops, café/bars and restaurants. 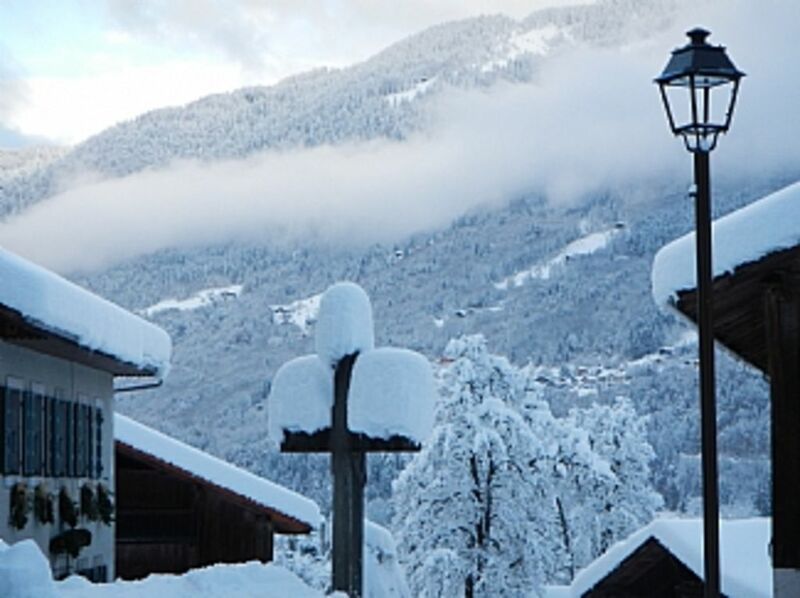 The beautiful alpine village of Samoens is just 3km away. Samoens has an outdoor pool complex and plays host to the biggest market in the Haute Savoie on Wednesday mornings. You can get straight onto the hiking and biking trails from the door of the apartment and if you don't mind a bit of off-piste, you can ski back to the door. Shower room with sink and a separate WC with sink. Attractive living/dining room with a large double sofa bed. The apartment is in Morillon, just 10 minutes walk from the village centre and is a great location for skiing and snowboarding holidays. The apartment is 500m (5-10 minute walk) from the Morillon cable car which gives access to the entire Grand Massif ski domain (Flaine, Les Carroz, Morillon, Samoens, Sixt). The Grand Massif includes 265km of pistes and is the 4th largest ski domain in France. The area caters for skiers & boarders of all abilities from first time beginners to powder experts. There is also a ski bus stop just outside the door of the apartment (40m). The ski bus links Morillon, Samoens and Sixt ski resorts. There are 2 English-speaking ski schools in Morillon. If you hire your skis from our recommended hire shop - Rol' Sports - which is next to the cable car, you can leave your ski equipment at their shop at the end of each day. The nearest course is in Les Gets, which is a half hour drive. Notes on accommodation: We live in Morillon village year round so we will be able to meet you when you arrive to give you your keys and answer any questions that you might have. Outside: There is an outdoor parking area. Utility Room: Washing machine. Cleaning / Towels / Linen / Maid service: Towels and bed linen are included. The property is cleaned weekly or at the end of each stay if this is less than a week. Towels and linen are changed weekly. Had everything you need and only a short walk to telecabine. Mary was helpful with details on getting ski pass, ski hire. ROL Sports let you store your hire gear in the shop so you don’t have to carry skis and boots back to the apartment every night. Some tasty options for eating out in Morillon village. Good communication with the owner prior to and after booking. Easy and convenient access arranged which was welcomed after a long drive. Good size accommodation that was bigger than the photo's suggested. Everything provided for a comfortable stay, good facilities and the owner was on site to make sure that everything was OK. Handy for the Morillon telecabin which was a short walk away. Would definitely recommend and return to the chalet if available. This is a great apartment that is much larger than it appears in the photo's. It's really comfortable and well located. We stayed for 5 nights and hired our ski's from Rol so we didn't have to carry them which was great as the apartment is slightly uphill. However there is a bus if you are transporting ski's every day. Without ski's it's a really nice walk. The owners are great, really helpful, I wouldn't hesitate to stay here again. We have just returned from our second stay at this spacious clean apartment. This time we took our 3 sons in their early twenties and there was plenty of room for all of us plus good WiFi. The apartment is only a few minutes walk from the ski lift and the village so is in an ideal location and also at a good price. We had a great holiday and enjoyed plenty of skiing and no doubt will be returning again. This is a lovely apartment, bigger than the "ski cupboard" we rented previously as the kitchen / dining / living area is totally separate, and the bedrooms are a decent size. The bunk beds are quite wide and while we used them for children, I'm sure they'd be fine for adults. The beds are very comfortable also. It's great having your own front door and the car can be parked right outside which makes lugging equipment and stuff a lot easier. Great value - we had a fantastic stay. Thank you. We run Ride the Alps, which offers fully guided mountain biking holidays in the Spring, Summer and Autumn. Jamie is a fully qualified Mountain Bike Guide and has been guiding trips right across the Alps including in this area for last ten years. Some routes and tips are given free of charge if you are staying here to bike on a self-guided basis. However it is also possible to book a fully guided week of mountain biking or to book 2 or 3 days of guided riding, depending on Jamie's availability. Jamie is a qualified International Mountain Leader and is a snowshoe guide and igloo builder in the winter months in this area. If you fancy getting away from the crowds during your stay or have non-skiers in your party then Jamie is available to take you out on a snowshoe hike and show you the natural beauty of the mountains. Or he can build you an igloo outside of the apartment! The nearest airport is Geneva, which is just under an hour away by car. There are several airport transfer providers who can bring you to Morillon from Geneva airport. Morillon is 8 hours drive from Calais. A car is not necessary in winter if you are coming on a winter sports holiday. The apartment is walking distance from the ski lifts. Ski buses stop by the door regularly. In the summer it might be a good idea to bring or hire a car if you want to explore beyond the valley. In Morillon village there is a small supermarket, a bread shop, a cash machine, several restaurants, cafes/bars, a newsagent, a pharmacy, numerous ski hire shops and a variety of other shops. The nearest post office is 1.5km away in Verchaix. The nearest bank is 4km away in Samoens. Just 1km from the apartment in Morillon there is the "Base de Loisirs" by a lake with a beach area, which is perfect for young children. In the summer there are a range of activities on offer including swimming, horse riding, a tree top adventure park and a children's play park, trampolining, volleyball, tennis etc. In the winter the area is set up for cross country skiing and sledging. The nearest outdoor swimming pool complex is 3km away in Samoens. The nearest indoor pool complex is 20 mins away by car in Cluses. The whole area - Haute Giffre and Grand Massif - is one of the best places in the Alps to go mountain biking. There is a huge network of trails including some of the finest natural singletrack you'll find anywhere. There are trails for both downhill and cross country enthusiasts. The cable cars and chairlifts take bikes in the summer months. Bike hire is available in Morillon and Samoens. We also offer guided mountain bike rides and holidays. You can go rafting and kayaking on the river Giffre with several rafting companies based in Samoens and Sixt. We recommend "Nunayak" in Sixt. There are excellent trails for hiking and trail running with a network of mountain refuges for refreshments or overnight adventures. The road biking in this area is superb. The Tour de France has been through Morillon several times and one of the toughest Cols in this race - the Col de la Joux Plane - starts in Samoens village, just 4km away. Changeover Day: Changeover days are Saturday-Saturday in the winter season. We are flexible the rest of the year.